1. Edward PUCKERING merchant, born 1689, married 1st Unknown UNKNOWN c1705, died before 1725, married 2nd 22 December 1724 Bridlington Jane RUNDALL. 1.1. Edward PUCKERING baptised 1 February 1707 Bridlington. 1.2. Thomas PUCKERING labourer, baptised 10 March 1710 Bridlington, married 20 November 1739 Eleanor BARKER born Sewerby. 1.4. Ann PUCKERING baptised 4 November Bridlington, died January 1715. 1.2.4. Robert PUCKERING baptised 13 March 1755 Bridlington, buried 23 May 1822 Withernwick, married 24 July 1786 Withernwick Jane SKELTON (daughter of Robert SKELTON) baptised 8 March 1746 Filey, North Yorkshire. 1.2.4.1. Hezekiah PICKERING baptised 10 February 1787 Withernwick, buried 22 November 1788 Withernwick. 1.2.1.3.1. George Brown PUCKERING agricultural labourer, baptised 20 December 1803 Hutton Cranswick, buried 27 December 1876 Hutton Cranswick, married 1st 17 January 1831 Leven Ann WILSON baptised 18 August 1805 Foston-on-The-Wolds, buried 12 Februry 1848 Hutton Cranswick, married 2nd Mary UNKNOWN born c1813 Wawne. 1.2.1.3.2. Boaz PUCKERING agricultural labourer, baptised 15 December 1807 Hutton Cranswick, married 29 January 1829 Nafferton Margaret SUTTON died before 1835. 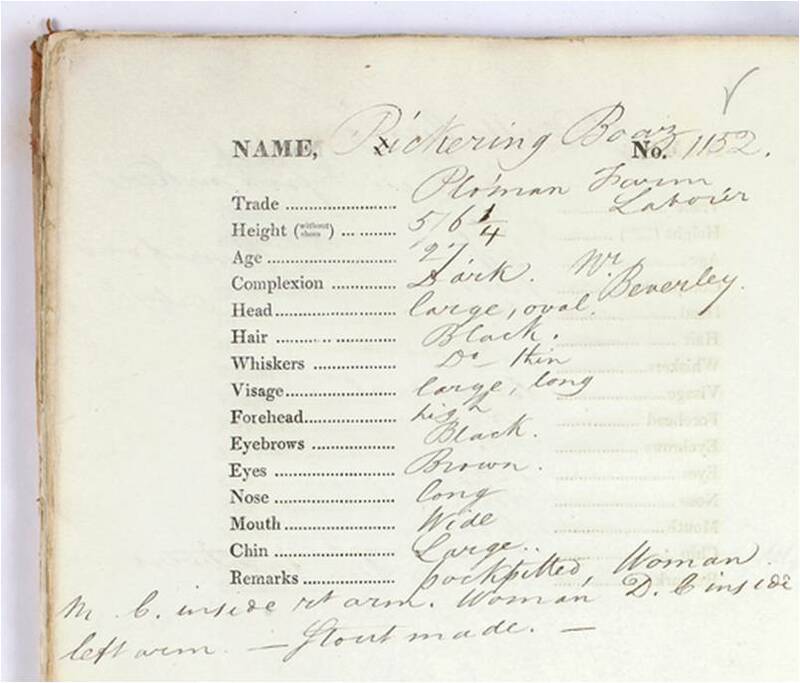 Boaz Puckering was tried on 30 June 1834 at York Assizes for sheep stealing. It was a repeat offence and he was sentenced to transportation for life in Australia. He sailed on 14 May 1835 from Sheerness on the Norfolk and arrived on 28 August 1835 in Van Dieman’s Land (Tasmania). A gaol report describes him as “an idle, sulky man, of bad disposition”. 1.2.1.3.3. 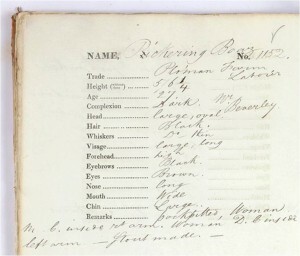 Timothy PUCKERING baptised 30 December 1810 Hutton Cranswick. Timothy Puckering was tried on 26 December 1829 at York Assizes for sheep stealing and sentenced to transportation for life in Australia. He sailed on the Nithsdale and arrived on 26 August 1830 in New South Wales. 1.2.1.3.1.1. John Dixon PUCKERING baptised 18 Septezmber 1831 Hutton Cranswick, buried 18 April 1833 Hutton Cranswick. 1.2.1.3.1.2. Mary PUCKERING baptised 23 September 1832 Hutton Cranswick. 1.2.1.3.1.4. Hannah PUCKERING baptised 11 May 1842 Hutton Cranswick. 1.2.1.3.1.5. Ann PUCKERING baptised 13 Februry 1848 Hutton Cranswick. 1.2.1.3.2.1. Jane PUCKERING baptised 31 March 1830 Nafferton. 1.2.1.3.1.3.1. Fred PUCKERING baptised 1 May 1872 Hutton Cranswick. 1.2.1.3.1.3.2. Catherine Ann PUCKERING baptised 1 June 1873 Hutton Cranswick. 1.2.1.3.1.3.3. Walter PUCKERING tailor, 2 April 1877 Hutton Cranswick, married 1910 Driffield Mary Jane MARSON born 1877 Dalton Holme. 1.2.1.3.1.3.4. Charles PUCKERING 21 February 1879 Hutton Cranswick. 1.2.1.3.1.3.5. Alfred Summerson PUCKERING born c1881 Hutton Cranswick, East Yorkshire, England and died Nov. 1886 Hutton Cranswick. 1.2.1.3.1.3.6. Mary Summerson PUCKERING baptised 20 December 1882 Hutton Cranswick. 1.2.1.3.1.3.7. John Robert PUCKERING baptised 22 June 1884 Hutton Cranswick.